of slender tapering form, decorated on the high, rounded shoulder with a blossoming prunus branch cut through the glaze, the exposed porcelain fired to an attractive pale reddish tone on the freely incised sprig, the single prunus blossom colored chalk-white, the decoration showing a dry texture in contrast with the glossy surface of the finely crackled ivory-white tinted glaze, the short narrow neck tapering up to a small mouth, the glaze pooling slightly on the lip and around the base of the neck, the neatly pared footrim and recessed base unglazed and the exposed porcelain showing a pale reddish tone in some areas. The distinctive style of the decoration on this vase and the box illustrated on the preceding page was invented by the potters in Jizhou province during the Southern Song. 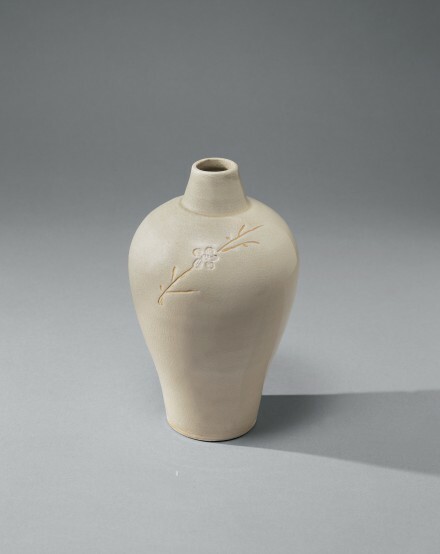 Margaret Medley, in Yuan Porcelain and Stoneware, London 1974, pp. 127-128, suggests that a combination of methods was used. In most cases it appears that a stencil was laid down on the unglazed and still slightly damp body; the design of the stencil was cut into the body and painted with a resist; the stencil then was removed and the whole was covered with glaze. Alternatively, a paper cut-out could be stuck to the surface with adhesive, the glaze applied and the cut-out immediately removed, with further details incised as a final step. For a complete scholarly treatment of the origins and significance of the plum blossom motif in the art of the Southern Song, see Bickford, Bones of Jade, Soul of Ice: The Flowering Plum in Chinese Art, New Haven, 1985, with a chapter entitled “The Flowering Plum in the Decorative Arts”, pp. 193-243.